Burgers, burgers everywhere. Every hyperlink you click will take you to yet another write up from another fellow blogger on the humble burger. I mean, how many iterations of a burger can you get? After all, it's just a beef patty between two bits of bread isn't it? Wrong. There are so many permutations that achieving the perfect burger is becoming somewhat of a science. Some claim that it doesn't need to be that hard at all, in fact, they have even petitioned for the famous West coast chain of In n Out to broaden their horizons to the UK. Some have even recreated famous US versions of the burger in their own home. Hell, even I did my own little mission in the US of A to discover what it is about their burgers. The burgers in the UK simply don't compare. A different attitude, a different approach and frankly, it feels like for many, a burger is just something they feel they should have on the menu without a great deal of thought about what a good burger really is. It's not really surprising that so many lovers of food have taken it upon themselves to discover the holiest of all holy grails in food terms for many, the perfect burger. 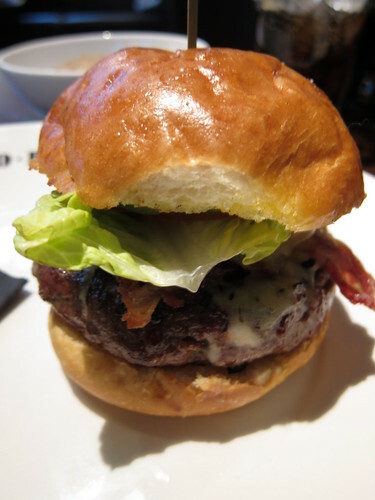 The Hawksmoor, a renowned steakhouse, is reputed to have an excellent burger. 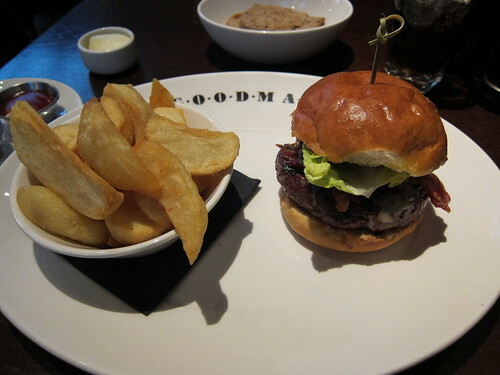 I have yet to try it, but busied myself on a hectic Monday with a visit to another steakhouse, Goodman on Maddox street. 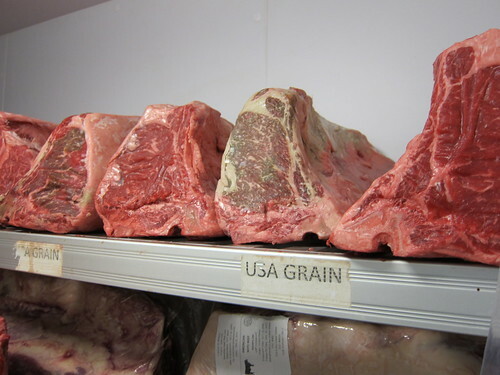 I have already written about the excellent steaks on offer here. It's one of those rare places, a high end restaurant that I keep finding myself coming back to again and again. This time, it was all about the burger. At £12 with chips and numerous choices of fillings at no extra cost, I may even consider this a bargain. Made from prime USDA offcuts, with a bit of chuck thrown in, the burger tastes like a handheld version of their steaks. The patty was juicy and perfectly pink, almost flaking apart as it hadn't been minced into oblivion. I added cheese and bacon, although in hindsight, I think this was an error. The burger was perfectly seasoned and the additional toppings just made the whole burger a bit on the salty side. My only negative point is that burgers need a good pickle, and unfortunately this one let it down with little of the required piquancy. So there you have it, great steaks and great burgers. It helps that the manager of Goodman is as passionate about his burgers as his customers are. A brief chat revealed that he is definitely a burger man and has a few tricks up his sleeves in this department, which leads me to the question, whatever are Goodman going to do next?? ?